Once upon a time last week I was walking home from Prati when I came upon St. Peters Basilica, glowing in golden evening light. Bernini’s famous piazza, so aggressively crowded during the day, was nearly empty. For the first time I could hear the rushing water of its twin fountains. As I drank in the beauty, I raised my gaze above the dome of St. Peters where I was surprised by the sight of a couple hundred birds. These birds were making fast and crazy circles across the sky. They formed a sort of chaotic mass-a pulsing thundercloud of wings. They were quite loud. The birds interrupted the serenity and solemnity of the famous view before me, but at the same time they brought it to life. Before this moment of late night bird-watching at the Vatican, nature had almost no place in my perception of Rome. Since then, I have really come to appreciate the daring yet dignified lives that Roman birds, plants and small mammals are leading in the background of my modern city life. 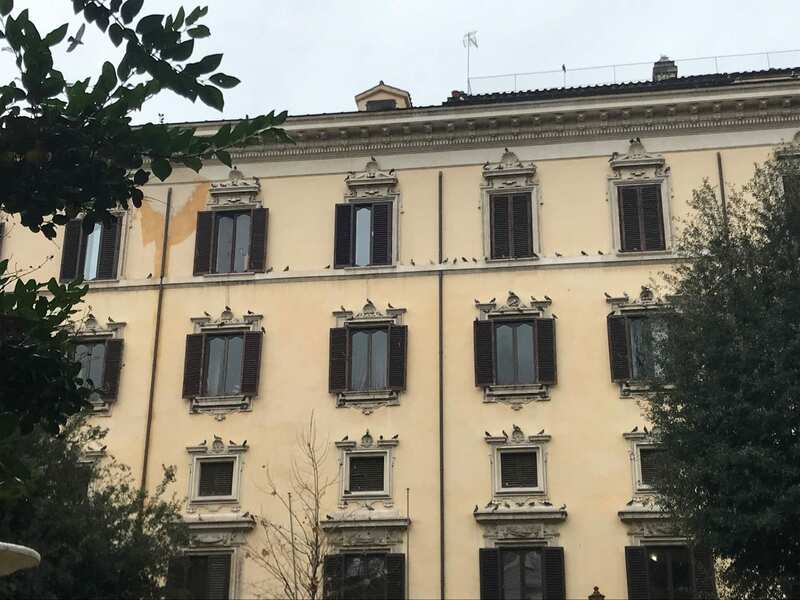 I have also convinced myself that the area surrounding Palazzo Santa Croce is the unofficial seat of Rome’s urban animal kingdom. Perhaps I can convince you too. I do believe that our neighborhood enjoys a heightened presence of animals. For the first case in point we need look no farther than our nearest ancient monument: The Area Sacra di Largo Argentina. This rectangular excavation site houses the remains of four early republican age temples, but it is probably more famous for the stray cats that roam languidly among them. Cats have populated the Area Sacra, “Sacred Area”, since excavations began there in 1929 and the Torre Argentina Cat Sanctuary was established in 1993 to provide for them. 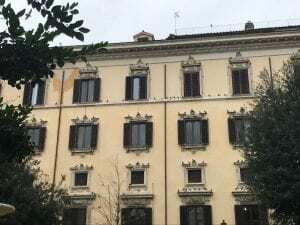 While it has gained a mighty following among locals and tourists, the cat sanctuary has also faced serial challenges by city officials who deem it hazardous to Rome’s public health and cultural patrimony. Yet the cats remain. 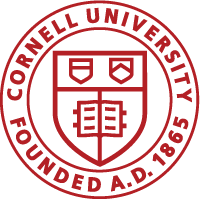 By this point they seem to claim a cultural patrimony of their own. 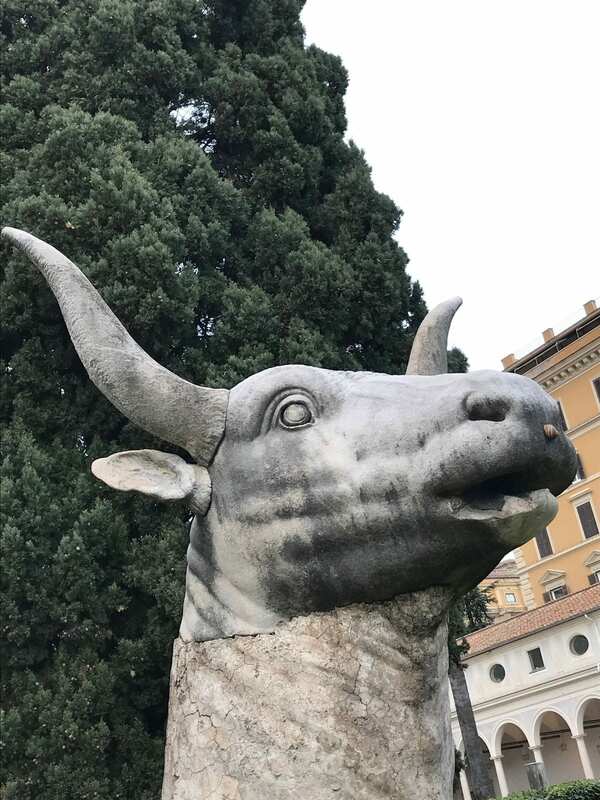 The Piazza Benedetto Cairoli park is another prime site for natural observations, and it is directly adjacent to our Palazzo. I would call this park an unofficial bird sanctuary. 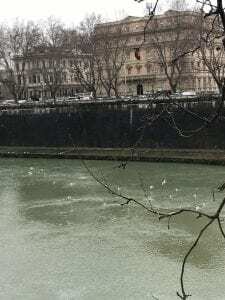 Birds of every type cluster on the gravel, circulate above the park and adorn the statue of Benedetto Cairoli with their excrement. Most interesting to observe is the way they interact with the facade of Palazzo Santa Croce itself. Each time I pass by the park, I am struck by sight of pigeons posed in profile along the tops of the windows. The first time I saw them there, it actually took me a moment to decide whether they were real birds or sculptures. I must also mention the Tiber. I am astounded by the use that so many different creatures make of such a degraded, neglected, utterly disrespected (but still beautiful) river. The Tiber’s banks are clogged with litter and all manner of plastic, metal and styrofoam curiosities flow in its cloudy water, yet seagulls glide along the teal surface as if it were paradise. I find myself both impressed and depressed by the sight of them. The Tiber also abounds in ducks. Ducks with glittering green necks, ducks with soft mottled coats in rainbow shades of brown, ducks with ducklings. As I am partial to walking along the Tiber, I have spent many moments leaning over its stone enbankment to admire them. When the ducks dip their heads under stream and tread water with their feet, I wonder what they could possibly be finding to eat down there. 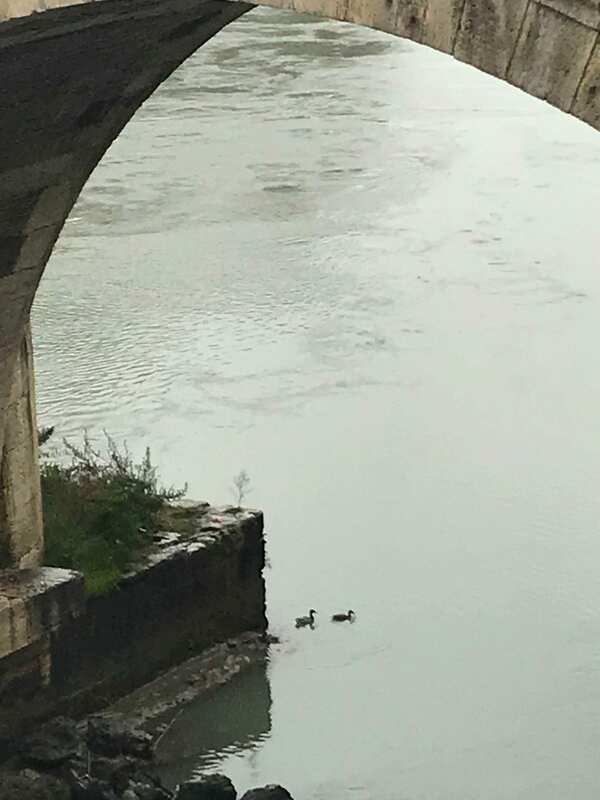 I once stood for a quarter of an hour on the Ponte Palatino bridge, watching in utter confusion as a small duck swam against the rushing tide. The inhabitants of Rome’s animal kingdom are perplexing, charming and mysterious creatures. They can only survive by a logic of their own, as nurturing she-wolfs have long ceased to populate these parts.